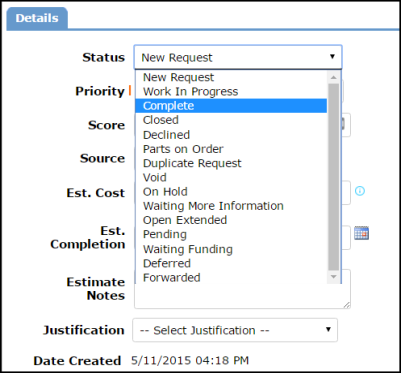 Capital Forecast offers two different status choices to use when completing Needs: Complete and Closed. It is a personal preference which status you choose to use, as they both function the same way in the system. You can make edits or additions to a Need that has been marked as Complete or Closed, but you will not be able to change the status of those Needs. If you need to change the status of a Need, including marking it Complete or Closed, you can do so from the Update Need form. If you know the Need ID, use the Search for box to enter the ID number and open the Need. Under the Details section, select the appropriate status from the Status drop down list. If you do not know the Need ID, click on the Needs tab at the top of the page. 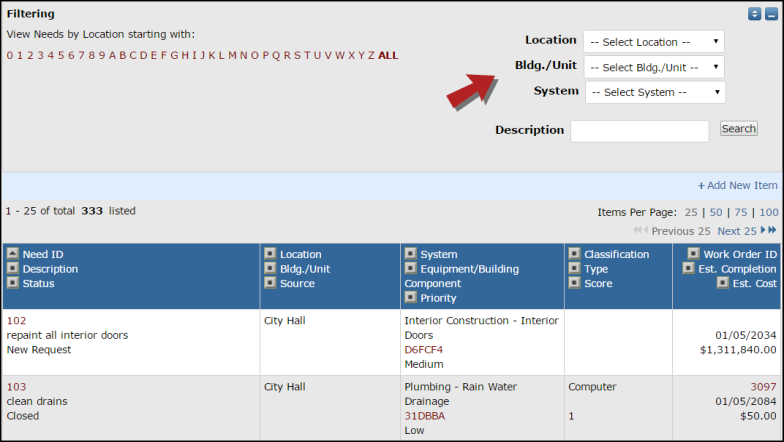 Use the Location, Bldg./Unit, System, and Description filters to look up your Need. Click on the Need IDto access the Update Need form and change the status.